- On behalf of the Working Group of Indigenous Peoples, I call on the Barents member states to enhance the efforts to fight climate change and improve environmental standards, said Tatiana Egorova at the 16th Barents Euro-Arctic ministerial meeting with foreign ministers from all four Barents countries present. The 16 Barents Euro-Arctic ministerial meeting was held in Arkhangelsk last week, where the minister of Foreign affairs of Russia, Sergey Lavrov passed on the chair of the council to Sweden and foreign minister Margot Wallström. In the plenary sessions Tatiana Egorova’s speech was highlighted by many. She represents the working group of Indigenous People, and came with a direct call to the ministers to act for improvement of the situation for indigenous peoples in the Barents region. - Consulting indigenous peoples ought to be natural, yet mandatory, in development processes. To make sure that the principle of free, prior and informed consent is safeguarded, before implementing any project of plan that will affect the livelihoods of indigenous peoples, Tatiana Egorova said in her speech. 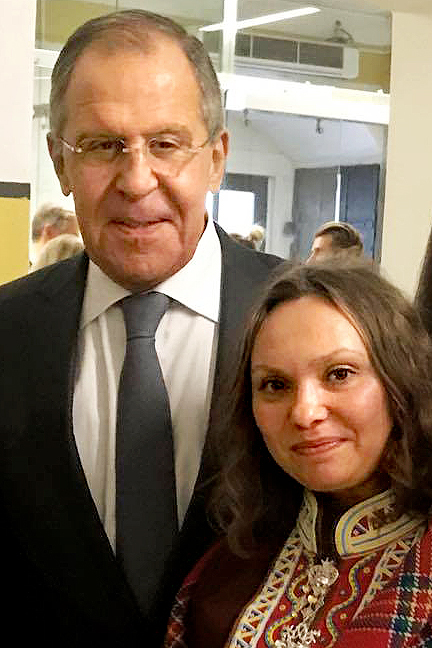 Foreign Minister Sergey Lavrov responded to this and highlighted the importance of the first Barents Indigenous Peoples Summit held in Moscow last April, where rights and other important issues of indigenous peoples where on the agenda. The summit was the first of its kind, bringing indigenous peoples and high-level officials together at the same table, where they engaged on a dialogue for a common future. - The summit has contributed with positive input on establishing a dialogue between indigenous peoples and authorities on equal rights, says Lavrov and stressed the need to follow up with a new summit. Tatiana Egorova says that the success of the summit deserves to be repeated, so that the views of indigenous peoples are included in the plans for the development of the Barents Region. - Consulting indigenous peoples ought to be a natural, yet mandatory, in these processes, to make sure the principle of free, prior and informed consent is safeguarded before implementing any project of plan that will affect the livelihoods of indigenous peoples, says Egorova. The Barents Euro-Arctic Region make their living out of natural resources, the earth and water, so the hunt for natural resources affect indigenous peoples. In Reindeer husbandry and farming they depend on grazing land, fisheries depend on healthy, clean eco-systems in the sea and fjords. Egorova criticised the mining industry in grazing areas, in Kvalsund, in Gállok, in Utsjoki, in the Kola Peninsula, in all fours member states and that they represent a threat to the reindeer herders and their livelihood. She also stated that disposal of mining waste in fjords is something only a handful of countries still do, Yet Norway insists on being one of the five. - On behalf of the Working Group of Indigenous Peoples, I call on the Barents Member States to enhance the efforts to fight climate change and improve environmental standards. I call on the Member states to respect indigenous peoples’ rights to a healthy and sustainable livelihood based on our traditions, says Egorova. After the meeting Egorova got a lot of positive feedback on her speech which they said addressed several important issues. She is very satisfied with the word of Lavrov about the importance of the Summit in April. Egorova also spoke with foreign minister of Sweden Margot Wallstrøm who holds the chair of BEAC for the coming two years. She also emphasised to Egorova the importance of continuing the good cooperation on these important issues. - The WGIP see it as important that the Swedish chair follow up on the initiative from Russia, and invite to a similar event as the Summit we had i Moscow in April, says Egorova.